Location: North exterior wall of the parkade at 10045-102 St. This mural evolved from a collection of photographs of cloud formations. 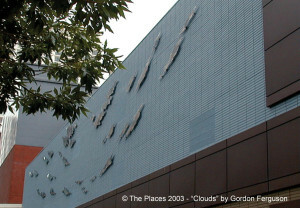 The 35 eight-foot stainless steel plates were laser-cut in a semi-circular format and carefully positioned along the parkade wall to create a pattern of cloud formations. Clouds integrates the forces of nature into the urban landscape. Biography: Recently included in the 2015 Biennale of Art at the Art Gallery of Alberta, Gord Ferguson’s interests include the reconsideration of manufactured consumer objects, constructed environments, design, language, advertising, corporate behavior and hierarchies of value in contemporary culture. Gord Ferguson’s work is represented in many museum and private collections across Canada. He has completed a number of public commissions and was the recipient of two Canada Council grants to support his studio research. Ferguson has been teaching at the Alberta College of Art and Design in Calgary since 1981 and is currently Program Head of the Sculpture Department. Ferguson was born 1953 in High River, Alberta.